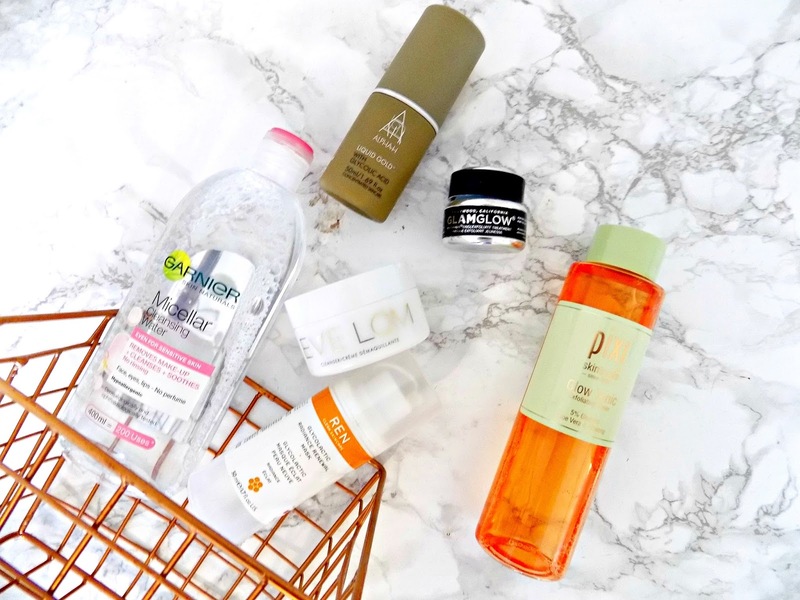 Cult Skincare Products | Are They Worth The Hype? I've found that 'cult' skin care can be very hit and miss. I'm guessing it's because skin care can be so subjective. But, when a lot of people are raving about a product it can be hard not give into the hype. I have on many occasions. So I thought I'd give you a little round up of these cult products that have made their way into my collection! I'm not even sure what skin type i have anymore, it keeps changing. But for the most part its dehydrated and turns more normal to oily in the summer. I plan on also doing one on makeup so keep your eyes peeled for that post. This is a highly raved about product and I've spoken about it on many occasions! This is an exfoliating toner that contains AHAs. With a cocktail of ingredients that promises to brighten, gently lift away dead skin cells, and refine the skin for a glowing, youthful, radiant skin. In my opinion this is definitely worth the hype! I've noticed such a massive improvement in my skin since using this. Its helped my dehydration lines, redness and definitely leaves my skin looking more glowing. This is another highly acclaimed AHAs product in the beauty world. I picked this up after other AHA products have worked so well on my skin. This has a much higher AHA content and its recommended to be used at night only 2-3 times a week. Its like a toner and you apply it to a cotton pad onto the face. This claims to dissolve dead skin cells, penetrate deep into the skin, help the renal and repair process, reduce acne scars, pigmentation issues and fight spot cause bacteria - for clearer, radiant more refined skin! With all those promises it was hard to resist! Is it worth the hype? I don't think so. First thing was it stung my skin when applying it. I used this twice a week at night and every morning my skin looked worse! It made my acnes scars flare and made patches around my nose red. I don't have sensitive skin, and my skin can pretty much tolerate most things, but I think this was just way too much for skin! The trusty genius's at REN promise that this mask will diminish almost any skin concern with this mask - it brightens, removes dead skin cells, refines pores, helps prevent fine lines, and leaves skin looking radiant and glowing! The consistency of this is thick, like jam and it's recommended that you leave it on for 10 minutes. I love love love this stuff! It really does what it promises! After I remove this I see a massive difference in my skin! Its looks so much more brighter. Definitely worth the hype! This cleanser has been around for many years and award winning Eve Lom have developed a huge cult following and its greatly loved by many celebrities! The cleanser itself is a balm cleanser that is such a joy to use. It feels so luxurious as it melts into the skin and removes makeup with minimal effort. Its even been described as the best cleanser in the world! Is it the best cleanser in the world though? Short answer, no. When I first started using this I loved it! But after a week my skin was covered in blackheads and wasn't as smooth as it normally is. At first I thought it was because it was working wonders on my skin, and pores must have been really clogged. However, I started doing some research and found it contains mineral oils. A pore clogging ingredient that can cause breakouts. I continued to use it for another week, in the hope that something that cost over £50 wouldn't do this to my skin. But no change. So I have to say this isn't worth the hype. I'm not sure if this Garnier micellar water in particular is a cult product, but micellar waters in general are, and have received some hype. I am sure most of you have heard of them but for those who haven't they're basically a gentle water that is designed to remove makeup quickly and easily. I love the idea behind them and I really wanted to give into the hype around them. But I just can't. I don't find them quick and they remove my eye makeup easily, in fact I have to use 6 cotton pads and then its still not all off! This is another award winner that is loved by many Celebrities! Its a face mask that works skin miracles in as little as 15 minutes. The combination of clay, minerals, oils work to exfoliate skin to reveal, radiant, fresh looking skin. This does tingle when applied to the skin but this is normal. Is this worth the hype? 100% yes! The best face mask ever. My skin looks so much better after this. It feels smooth, nourished and just over all better. Its pricey but well worth it! Have you tried any these? What are your favourite cult beauty products? Cult Makeup | Is it Worth The Hype?